Misplaced Blame On Childhood Ritalin For Later Substance Abuse : Shots - Health News People with ADHD in childhood are more likely to have problems with drugs and alcohol later. 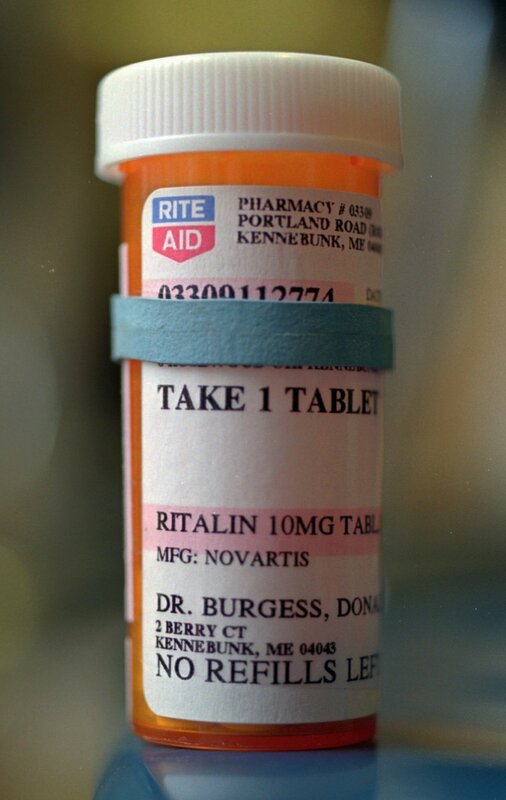 Studies have disagreed on whether treatment with stimulant drugs like Ritalin makes that abuse more likely, or protects against it. The biggest review yet says stimulant treatment neither helps nor hurts. Would a Ritalin prescription for a child with ADHD in 1997 foretell a substance abuse problem for an adult today? People who had ADHD in childhood are more likely to problems with substance abuse as adults. But there's been disagreement about whether treatment of ADHD with stimulant medications like Ritalin reduces that risk or makes future problems with alcohol, nicotine and illegal drugs more likely. The latest look finds that young adults who took stimulants as kids were no more likely to have substance abuse problems later than those who had ADHD but didn't take stimulant drugs. It's the broadest and deepest analysis yet, but it still leaves many questions unanswered. Researchers at UCLA looked at 15 studies that followed more than 2,500 children with ADHD from about age 8 to about age 20. Those studies looked for problems with drugs, including nicotine, alcohol, cocaine and marijuana. The researchers found that on average, the people who had taken stimulant medications in childhood were not more likely to have substance abuse problems than people who hadn't. "For any parent, the decision to pursue treatment is not a simple one," says Steve Lee, a UCLA associate professor of psychology and senior author of the study. It was published online by JAMA Psychiatry. "The most realistic way to think about these findings is that it's not perfect, but it's the best evidence we have now," he tells Shots. Parents are more likely concerned about immediate side effects associated with stimulant medications, including lack of appetite, sleeping problems, and stunted growth, Lee says. He urges parents to talk about both short-term and long-term effects of the medications with their child's doctor. Earlier reviews came to different conclusions than this one. Some found that taking Ritalin reduced future risk, while others found increased harm. The discrepancies may be due to how old participants were when they were enrolled, and how the teenagers or young adults were when they were evaluated for substance abuse problems. This study isn't immune to those problems, Lee says. Age 20 is when problems with drugs and alcohol are typically just becoming apparent. As studies follow young adults past age 25, he says, they'll get a clearer idea of who is at risk, and why. Lee's lab is working on that kind of study. He is following 230 children, both with and without ADHD, to identify early predictors of alcohol abuse. They've got a ways to go. They started when the children were 6 to 9 years old, and they're 10 to 13 now. Several theories have been put forth as to why people with ADHD are more likely to have substance abuse problems. One is that the impulsivity that can characterize the disease leads to poor decisions about risks. Another is that taking a stimulant in childhood could somehow lead to changes that make a person more vulnerable to future drug abuse. Stimulant drugs work on some of the same brain pathways as do drugs of abuse. ADHD in childhood may make it more likely that people are obese as adults, researchers at NYU Langone Medical Center reported last week. It's not clear whether that would be caused by neurobiology or behavior.